This pico de gallo is pretty mild since I had made it for the kids. 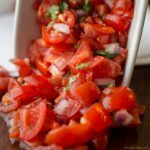 I had a lot of cherry tomatoes that needed to be used before they went south so I decided to make a pico de gallo recipe that the kids would eat too. I hadn’t realized it would go over so well with my youngest. Traditionally, pico de gallo contains a spicy pepper, such as jalapeno, which doesn’t go over well with my younger crowd. To make this a quick and easy snack, I used pre-minced garlic in a jar and left-over onion I had chopped the other day. This recipe is speedy and easy and appealed a great deal to my 13-month-old. As I was staging the food for taking the picture, I turned around to grab a piece of camera equipment and turned back around to find Mandolin (my 13-month-old) fist-deep in pico de gallo. She wouldn’t relent so the first shot I took had to suffice. To supplement, I took a couple quick snaps of Mandolin in mid-action. The lack of spicy pepper doesn't detract from the fresh, crisp flavors of the tomatoes, onions, and lime. It's also healthy and leaves you wishing you had made extra. Using a sharp knife, dice the tomatoes, onion, and garlic (hint- I use so much garlic in my cooking that I buy garlic pre-minced in large jars and get great results). Take care to get rid of as much of the tomatoes’ juice and seeds as possible. Roughly chop your cilantro. It has a strong flavor so add this to suit your taste. In a medium bowl, combine the tomatoes, onion, cilantro. Add in the garlic, salt, and lime juice (to taste) and toss. Serve with tortilla chips or use in another recipe.